Have you noticed changes in your insurance premiums? Insurance premiums can increase or decrease annually based on several different factors. These factors can be personal, like if you undergo a major home renovation or add a teen driver to your car insurance policy, or external, like technological advancements or economic changes in the world around us. To help you better understand how and why your premium may change, here’s an explanation of some of the factors that can influence your home and auto insurance rates. Changes to weather patterns, geography, or an increase of catastrophic events such as hurricanes or windstorms can all affect the rate of your home insurance premium. The proximity of your home to emergency services is also taken into consideration when determining your cost of insurance, so if these services move further away or closer to your home, you could also see a change in your premium. Lastly, local and regional crime trends can increase or decrease the risk of owning a home in a specific location, which in turn can increase or decrease your insurance rate. 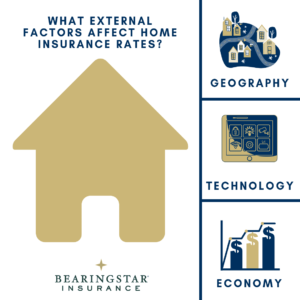 Technology can also influence home insurance rates in a number of ways. Installing things like alarm or home security systems and safety devices like smoke and CO detectors not only make your home safer, they can also impact your insurance premiums. 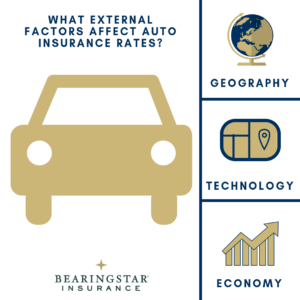 The third factor that can influence your insurance rate is the economy. Inflation, rising home values, changes in material costs, and changes in local building codes are all taken into consideration when determining your insurance premium. Just as with your home, if your car is registered and garaged in a location that experiences catastrophic weather events, your car is at greater risk of a claim — a factor that can affect your insurance rate. In addition to weather, driver trends and population changes can also influence insurance rates. For example, as distracted driving becomes a more prevalent problem with drivers today, rates of accidents increase, along with insurance premiums. As technology advances, cars may become smarter, but they also become more expensive to repair. Backup cameras, lane-departure assistance features, or rain-sensor windshield wipers are all examples of advanced technology that require computers and expensive parts to fix, repair, or replace in the event that they are damaged or destroyed in an accident. We once again see that economic trends can dictate car insurance rates. For example, high employment rates can lead to more drivers on the road. With more drivers on the road, there is an increased risk of accidents, which in turn can lead to changes in your insurance premium. Inflation can also increase the cost of materials needed to fix cars after accidents, which again impacts insurance rates.